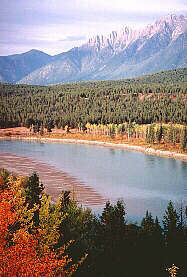 To visit the British Columbia Rockies continue from Cranbrook on Highway 3 and head northeast to Elko, Fernie, Sparwood and the Alberta border. From Elko to Sparwood you will travel through the Elk Valley, aptly named for the many herds of elk seen by early settlers. This region is unique as it is capable of supporting large populations of big game. The town is named after William Fernie, who helped develop this area's coal mining. Fernie was established at the turn of the century when the railroad arrived. Legend has it that the founder, William Fernie, jilted an Indian maiden and in return her father placed a curse on the name 'Fernie'. Unfortunately events that followed are more real than legend... In 1902 an explosion in the mine killed 128 men. In 1904 and again in 1908, there were fires and floods. In 1964 it is said that Chief Red Eagle removed the curse. This equipment was used in Flathead Valley, near Fernie, from 1914 - 1920. Heritage buildings include the 1906 brick courthouse and the 1904 city hall. Located 28 km (18 miles) northwest of Fernie and 21 km (15 miles) from the Alberta border, Sparwood was established in 1966 to replace the towns of Natal and Michel which were to close to the mines and the coal dust the create. North from Sparwood is Elkford and Elk Lake Provincial Park.